Make family memories at East Cavalry Lodge, your peaceful hideaway just outside Gettysburg! Tucked in the woods on a quiet road, you may forget that you're only a few minutes from shops and restaurants in the bustling heart of the historic town. This light-filled, split-level home is beautifully decorated with comfort in mind. Guests often comment that the house is much bigger than it looks! The cozy cottage-like facade conceals a roomy interior with plenty of room for your group to spread out. It is ideal for large families. The large yard is completely private, surrounded by woods. You will enjoy spotting wildlife from the deck by day, and relaxing by the fire ring at night. There is plenty to do inside, too. History lovers can retreat to the den, sinking into a comfy chair with a few volumes from the owners' library of military and history books. There is a comfortable TV room with Internet TV (Netflix and Roku provided), lots of local Antenna TV channels, and family-friendly DVD's. Families love gathering around the game table (seats 6-8) in the den to work on a jigsaw or sample our collection of board games. Featuring a split-level layout, the house may present challenges to travelers with mobility issues. It is not wheelchair-accessible. The four levels are separated by three short stairways of 5-7 steps each. Please contact the Owner with any questions about the property. There is also a rollaway bed which can be placed wherever needed. *Please note that Bedrooms 1 and 2 are across from each other on the upper level, while Bedroom 3 is downstairs. Because of its distance from the other bedrooms, Bedroom 3 may not be suitable for small children requiring close supervision. Dave and Kathleen Craine always knew they wanted to retire one day to Southern Pennsylvania. Then in 2012 they decided 'Why wait? ', and moved the family from metro DC to beautiful Gettysburg. Dave, a native Pennsylvanian, has since dug deep into Civil War history. Kathleen, a transplanted Southerner, is intrigued by the art, culture and architecture of Southeast Pennsylvania. The Craines live with their kids and Siberian Husky in a stone farmhouse just down the road from East Cavalry Lodge. The first time they set eyes on this property, Dave and Kathleen recognized it's vacation potential. "It's exactly the kind of place we'd want to stay if we were visiting Gettysburg with our family." A private, woodland retreat mere minutes from all that Historic Gettysburg has to offer ... East Cavalry Lodge is indeed a special destination, combining the best of both worlds. East Cavalry Lodge, as its name suggests, is extremely close ... less than 2 minutes' drive ... to the East Cavalry Field, a section of the Gettysburg National Military Park that saw a significant cavalry battle on Day 3. For travelers to Gettysburg, the location of East Cavalry Lodge, near US-30 and US-15, is ideal as a home base for day-trips to Lancaster (1.25 hrs), Hershey (1 hr), Baltimore (1.5 hrs) and Washington DC (2 hrs). For Civil War enthusiasts, all the epic landmarks of Gettysburg's 3-day battle can be reached within a few minutes, and Gettysburg National Military Park's Visitor Center is less than 10 minutes away. Harper's Ferry, WV and the Antietam Battlefield in Sharpsburg, MD are each 1 short hour away. What to do on rainy days? Outlet shopping and 2 multiplex movie theaters are located within minutes. Banks, Sheetz (fuel), Walmart, Giant Foods, Panera, Starbucks, McDonalds, Wendys, Taco Bell and Burger King are only 6 minutes away. If medical care becomes necessary while staying at East Cavalry Lodge, Wellspan Readycare and Wellspan Gettysburg Hospital Emergency Department are a 13 minute drive. East Cavalry Lodge is nestled in a secluded woodland clearing on a quiet road just 2 miles outside Gettysburg. Ductless mini-split air-conditioning in the upper level. Because of the house's open, split-level design, the cold air sinks and cools the ground level. Lower levels stay cool. The house is heated with a combination of ductless mini-split units upstairs and electric baseboard heaters elsewhere. The heat in each room is individually controlled. Parking for up to 5 vehicles. There is no street parking. No RVs. Dining Room seats 6-8. There is also a 2nd table seating 6-8 downstairs in the Den. Just outside the dining room on the deck enjoy seating for 12. We have 2 high chairs. Internet TV Netflix account Antenna TV with good reception of 40+ stations. 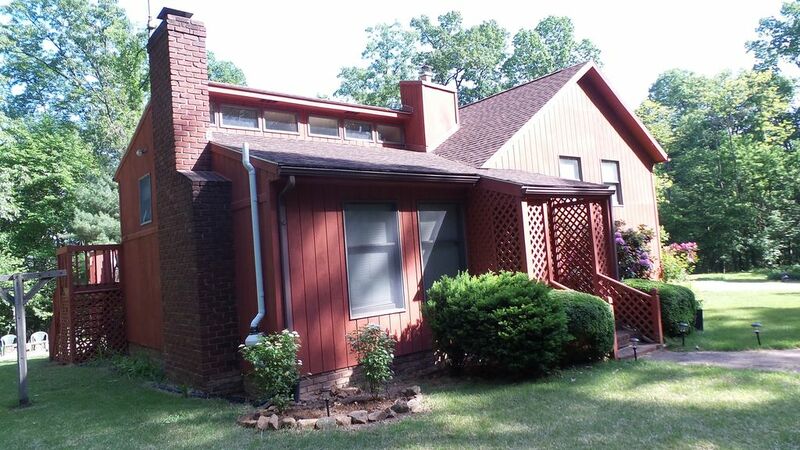 .75 acre lawn with 2.5 additional wooded acres to explore. Fire ring in yard. Clean, welcoming, and so much space! There were 9 of us (4 adults and 5 kids) - we all slept comfortably, had plenty to do, and had many rooms to choose from for having time away from the whole group. Would definitely return! Clean, good upkeep, well-stocked, attention to detail. We had a great stay at the house. Made some wonderful Thanksgiving memories with our family: cooking together, touring Gettysburg in the freezing cold, coming back and making campfire s'mores, playing games, etc. Everyone (9 adults and 2 little ones) slept comfortably and there were no traffic jams for using the bathrooms. I was esp. impressed with how clean & orderly the house was. We will come again if we have the opportunity. The house was very comfortable and clean. We liked how it was secluded yet close to lots of activity. Great time! East Calvary Lodge is an exceptional rental home. It is huge inside with plenty of room for a large group to spread out and yet still have privacy. From the moment we arrived to a well lite front entrance to the beautiful interior, we discovered everything you need to relax, cook, play board games, read or watch movies. Then when ready to tour the battlefield and town of Gettysburg you'll find plenty of brochures for the surrounding area. We couldn't have asked for better more attention to detail. You cannot go wrong with this property. Looking forward to coming back in warmer weather to enjoy the outside deck and surrounding property. Perfect location to enjoy a weekend away close enough to major attractions, but secluded enough to enjoy some solitude. Great location with plenty of room and family friendly! The host was very timely to any questions, they left the place very clean and had everything available from kids to adults for entertainment. Would highly recommend and will be back in the future! Gettysburg is rightly known for its extensive Civil War battlefields, scene of the 3-day historic battle in 1863. As home to three colleges and the county seat, this picturesque town also offers cultural events, as well as memorable dining and shopping. Explore the antique shops of Gettysburg and nearby New Oxford, or enjoy some "retail therapy" at The Outlets of Gettysburg. Wind down at one of Adams County's beautiful wineries or spend the day at Gettysburg's annual Wine Festival in September. Follow the Mason-Dixon Wine Trail any time of the year. For outdoor adventure, Ski Liberty, Michaux State Forest and Catoctin Mountain Park lie within minutes of Gettysburg. Heads-up to anglers: world-renowned fly-fishing awaits you at Yellow Breeches Creek half an hour to the north in Boiling Springs. Looking for family activities? The rolling foothills of western Adams County are home to a multitude of fruit orchards, earning the county's reputation as Apple Capital of the World. October's Apple Harvest Festival is an important regional event. Kids of all ages will love following the "Sweet and Salty trail" of a snack food factory tour in adjacent York County. Catoctin Zoo is just south of Gettysburg in Thurmont, MD, and even more family fun is just an hour away at Hershey Park and Lancaster County. Baltimore and Washington DC can be reached within a two hour drive. The "property fee" exists to pay for the Adams County lodging tax, which I must personally collect and remit; payment for the local Adams County tax IS NOT INCLUDED in the "stay tax".